What a week here at the St. C. Area Chamber of Commerce. We have been very busy. This week we made our way to the Caregivers Expo at the Ohio Valley Mall, WOW what a great event. So many vendors and what a great way to network. Megan and I traveled to Columbus to the 2017 Safety Council Leaders Conference it was filled with so much information about Safety Council, my question to businesses in Ohio "Why don't you join, not Why should I join" The savings alone is fantastic, but the other things you get from the Programs is amazing. Then we had our Executive Board meeting, again filled with so much information....Wow the energy in our chamber is AMAZING.....Then we had our Belmont County Safety Council Meeting (Awards Ceremony) So many awards......good job to all who won. Next today we went to the St. Clairsville Park and Recreation Center (www.facebook.com/StcRecCenter) for their Arbor Day Celebration. To see the trees at the amphitheater and to know that they will be there for many years, long after I'm gone is wonderful. So that was a week in a nutshell. 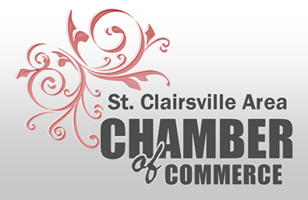 I really hope someone reads this and understands that we are committed to the growth of the chamber and to help our little big town of St. Clairsville.